It’s long been said that XTERRA is more than just a race, it’s a lifestyle. Perhaps nowhere is that more evident than in Ogden, Utah where the Mayor, Mike Caldwell, was the founder of the first XTERRA race in Ogden back in 2004. Ogden, UT (Sept. 16,2013) – It’s long been said that XTERRA is more than just a race, it’s a lifestyle. Perhaps nowhere is that more evident than in Ogden, Utah where the Mayor, Mike Caldwell, was the founder of the first XTERRA race in Ogden back in 2004. 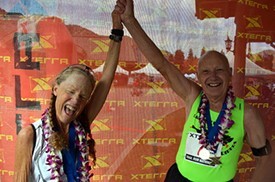 Mayor Caldwell and a collection of the coolest locals to be found anywhere rallied the entire community to bring off-road triathlon to their hometown a decade ago, and are still everyday XTERRA people. They swim, bike, and run in the mountains, have fun, eat well, laugh, and unpretentiously perpetuate the sports’ motto – “Live More”. XTERRA is indeed coming to town, in a big way, this weekend. Pros will race for $80,000 in prize money, dozens of cameramen will position themselves around Wheeler Canyon and the Wasatch Range to capture all the action for a nationally syndicated one-hour TV show, and more than one-thousand amateur athletes from nearly every state in the U.S. will come in pursuit of their dreams to race for an XTERRA National Championship. The off-road tri Nationals is Saturday, Sept. 21, along with full and half-distance XTERRA Utah races open to everyone. The XTERRA Trail Run Nationals half-marathon is Sunday, Sept. 22, accompanied by 5K and 10K trail runs. It’s important to note that you don’t have to be fast to join in the fun. For some, it’s just about finishing and that’s okay as XTERRA is all about perpetuating the healthy, active, outdoors lifestyle. In addition to the races XTERRA will host an expo in downtown Ogden on Friday with free kids races, vendor booths, a Paul Mitchell hair cut-a-thon for charity, and evening dinner parties. Then on Saturday from 8am to 10pm the streets shut down for a massive, community wide block party as Ogden hosts its 12th annual Harvest Moon Celebration with a wealth of family-friendly activities including live music, a farmer’s market, kid’s activities, arm wrestling, pumpkin decorating, downtown crit races, and fantastic fare from Historic 25th Street’s incredible restaurants. There is great entertainment to be found at Snowbasin Resort as well highlighted by the spontaneous, ecstatic, and sometimes tear-jerking displays of emotion at the finish line. While it is an epic spot for winter sports (think 3,000 skiable acres and 3,000 vertical feet) Snowbasin is also ideal in the summer time and when the Fall colors turn the mountain landscape into a kaleidoscope of colors, it’s simply spectacular. See for yourself after Trail Run Nationals on Sunday by joining the XTERRA Nation on the Patio at Earl’s Lodge with Holy Water Buffalo playing music for the Soul, followed up by the Shook Twins playing Folk as part of the Resort’s free Blues, Brews, & BBQ Concert Series. For more info and links to registration visit www.xterrautah.com, or call toll-free to 877-751-8880. The 2013 XTERRA Nationals weekend is presented by the Utah Sports Commission, Paul Mitchell, AVIA, and the XTERRA Live More Card. Sponsors include Snowbasin Resort, GOAL Foundation, Gatorade, Rudy Project, PowerBar, KSL TV, ENVE, Zorrel, MediaOne of Utah, the U.S. Forest Service, XTERRA Wetsuits, LifeProof, Muscle Milk, Choice Hotels, Rockwell watches, FootBalance, XTERRA Fitness, and Wasatch Distributing. WHO: More than 1,500 athletes from 45 states and 10 countries ages 9-to-76. WHY: Both the XTERRA Tri and Trail Run National Championship races are the culmination of 70-race nationwide series’ that end with a best-of-the-best showdown in Utah. TV: XTERRA TV is producing an hour-long, nationally broadcast television show on the USA Championship, highlighting Northern Utah as a mecca for outdoor adventure recreation.